“Kwayes?” Isma’ein says as he folds the woven tube and waves it in my direction. “Good. Very good.” Smoke billows from between his teeth, yellowed from tobacco. His weathered face radiates from genuine happiness and he chuckles as he taps the woven fold against my arm. It’s clear he wants me to take it and follow his lead in drawing smoke from the water pipe at the end of the snaking cloth tube. I nod, take the single fold out to its length and hesitate a moment. The others seated on the mats and leaning against the pillows in the mud brick hut stare expectantly, curiosity in their expressive features. It’s anticipation there, something about accepting convention, whether this ajnubi can accept local life. It’s a connection to tradition and to community. By joining in, I would be one step closer to them. I breathe in through the tube. The coals at the top of the nargileh glow brightly. Bubbles form in the jar below as smoke from the apple-flavored tobacco filters through the water. It’s almost as fascinating as the people around it. I’m no smoker and smoking itself is no longer popularly acceptable in western culture, but in the east it holds on in some ways. In the large, cosmopolitan cities like Cairo or Istanbul, smoking a nargileh (called a hookah in some areas) still happens but typically on a more individual level. You can order one in restaurants or go to dedicated smoking bars and receive your own pipe with an individual plastic mouth piece in a sealed wrapper. But in the smaller towns and villages people often gather around one pipe and share, handing the hose around the circle, always passing to the right. It’s semi-ritualized, a way to relax, chat, and bond. I cough. Isma’ein laughs and slaps my shoulder. Others make motions that show I should try again. We don’t really share a language but we are sharing an experience. 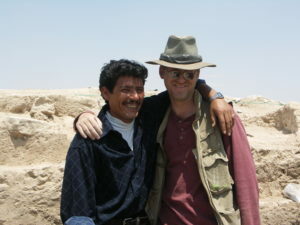 Site guard Isma’ein al-Hilef and the author at the site of Tell es-Sweyhat, Syria. So as we drank in the smoke together, we were becoming closer—displaying trust and a willingness to accept each other as colleagues. Similar social gatherings, on small and large scales and with varying accoutrement, have been connecting people for millennia. Recent discussions of banning drinking straws have brought this episode back to my mind. It may seem a bit of a leap from ‘drinking’ smoke with the Chafrat tribe in northeastern Syria twenty years ago to banning plastic straws today, but the idea stems from the feeling of ceremony and the evidence that early straws promoted the same kind of bonding experience I had shared with Isma’ein and his people. The Penn Museum, where I work, has some of the earliest drinking straws ever uncovered. These examples are 4,500 years old and come from the ancient city of Ur. I’ve been studying this city on the southern reaches of the Euphrates River in Iraq for about 15 years. In 1922 the Penn museum, jointly with the British Museum, began a major excavation there. Some of the artifacts and most of the records of the dig now reside in Philadelphia and London. The excavations lasted for 12 years and during this time the director, C. Leonard Woolley, uncovered some of the most famous Mesopotamian artifacts ever found. Many of them came from the Royal Cemetery. There were more than 1,800 graves in the Royal Cemetery but only 16 garnered the moniker ‘royal.’ These were typically the largest, with built tomb chambers, accompanying burials of attendants, and many luxury objects. Several included drinking straws, but not the sort we think of today. The most complete was four and half feet long and made of gold. Others were copper and covered with lapis lazuli. They were clearly for display as well as for use. Gold drinking tube from the tomb of Queen Puabi in the Royal Cemetery at Ur, ca. 2450 BCE (Penn Museum B16688). It was found with one end inside a large silver jar. Silver jar in which one end of the gold drinking tube was found in the tomb of Puabi (Penn Museum B17068). It may have contained beer; the straw would have allowed drinking from underneath the foam and floating detritus on top. Photo of Puabi’s gold straw and silver jar displayed together in Penn Museum’s new Middle East Gallery (see www.penn.museum for more information). Some of Puabi’s other drinking vessels are seen in the photo as well. Were they just luxuries, kings and queens showing off by sipping their fancy drinks through golden tubes while the masses could only look on in envy? It would be easy to think so given the circumstances of their find and the way we tend to use straws today, in a rather individual way, keeping our drinks to ourselves. But I would suggest they show almost the opposite, or rather that they developed out of a tradition of sharing that brought people together and slowly led to hierarchical structures that meant the wealthy could and did show off with their straws and other possessions. But how do we know these long tubes in the royal graves really were drinking straws? In this period of Mesopotamian history we have something of a perfect storm of evidence. We have the tubes themselves, buried with their owners often with one end still inside a large jar, but we also have depictions of people drinking from large jars through long tubes. 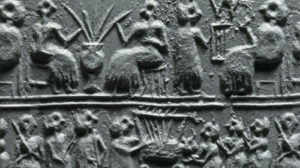 These depictions typically appear on cylinder seals, cylindrical stones with carved images that were rolled across clay tablets to leave an impression—a kind of authorization or signature. The banquet scene showing people drinking with long straws is relatively common on seals of the third millennium BCE, and there is some evidence of it in seal impressions a thousand years earlier. It typically shows two people flanking a large jar, each with a curved tube to their lips and the other end inside the jar. Two or three more straws are often depicted emerging from the same jar. This surely indicates other people sharing the liquid, but the seal carver could only show two given the medium of a small stone. 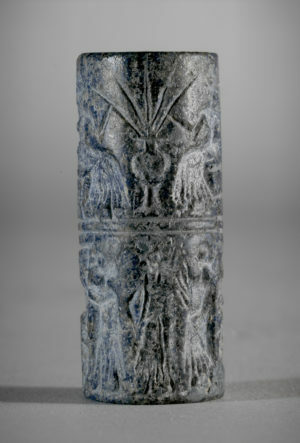 Impression of a lapis lazuli cylinder seal (Penn Museum 30-12-2) from the ‘Great Death Pit’ in the Royal Cemetery at Ur, ca. 2450 BCE. 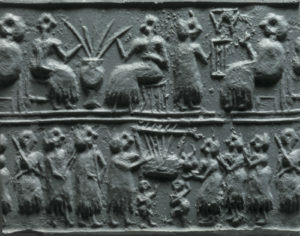 The impression shows a feast or ceremony with music, dance, and drinking from a communal jar with long straws. 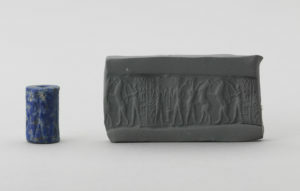 The lapis lazuli cylinder seal from which the impression was made (Penn Museum 30-12-2). The seal is on display in the new Penn Museum Middle East Gallery. Originally, the straws were nothing more than reeds. Ur was founded in a marsh some 7,500 years ago and so reeds were very common. They were used for many things, including baskets, mats, roofing material, and even for building houses. As the marshes receded and the head of the Persian Gulf silted up and pushed farther to the south, the inhabitants of Ur dug canals to their fields and the population grew. In the fourth millennium BCE, socio-political changes were on the rise—the land needed increasing irrigation and the state was forming. As societies grow beyond groups of extended family, they require something larger than the bonds of blood to keep them together. In order for a society to function, people must accept one another, unifying under some metaphorical banner. This process is benefited, perhaps begun, by ceremony and feasting. This seal, belonging to a man named Lugal-sasir (as inscribed on the seal in cuneiform), shows two standing men drinking from a jar using long straws. Next to them is a man fighting a bull and another fighting a lion. If read as different episodes of one story, perhaps the two men drinking are the same men sharing after successfully subduing the beasts. Many theories today point to the importance of feasting in early large-scale communities and the potential for these gatherings to lead to still larger groups through the bonds of friendship and socialization. Religion often establishes the bond, partially by sponsoring—or providing the backdrop for—feasting and ceremony. The early ‘temple’ at Gobekli-tepe in Turkey may point to this very process at an early period where small hunting and gathering groups likely met and formed a more permanent place for annual feasts. This would allow them to increase their gene pools by finding spouses outside their groups and could lead to larger social units as well as more sedentary lifestyles. Similarly, in Mesopotamia in the Uruk period of the fourth millennium and well before, people were gathering in larger and larger groups to share in crops, materials, skills, and ideas, essentially sipping the stuff of civilization. At these gatherings they may have made large jars of liquid, perhaps beer, and drunk together from the same pot by using long reeds. Unlike our small individual straws that, when made of plastic, are now threatening our environment, these long natural straws promoted sharing—many people gathered around one jar, discussing and drinking together. 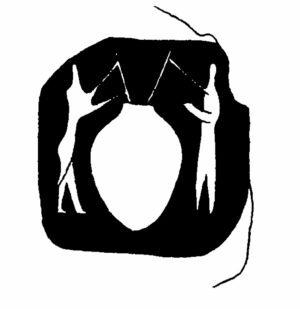 Drawing of a seal impression found on a lump of clay at the site of Tepe Gawra in northern Iraq dating around 4000 BCE. Two figures flank a large jar and each holds what may be a straw (image after Arthur Tobler, Excavations at Tepe Gawra, Plate CLXIII: 91, University of Pennsylvania Museum publication 1950). The actual seal impression is in the Iraq Museum (no. IM25048). As social groups grew larger, hierarchies established themselves and with the rise of kingship and administration to oversee larger group activities like growing enormous amounts of grain to feed the citizenry and weaving huge amounts of cloth to clothe them, the division of wealth also widened. 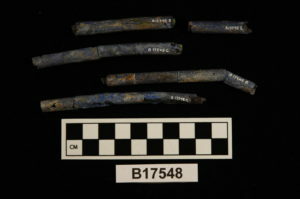 The straws that have been preserved in the archaeological record are those that had been wrapped in gold foil, or made of hammered copper tubes sealed with bitumen and decorated with lapis lazuli. The few luxury straws found in the royal tombs might be the tip of a proverbial iceberg, the visible correlate of perishable reed straws that were in much more common use. Above and below: Pieces of lapis, copper, and gold drinking straws from the Royal Cemetery (Penn Museum B17624 and B17548). This is not a plea for the straw any more than it is a plea for smoking. Instead, it is an observation on the sharing aspects of any feast or social gathering that even today helps us to bond and see each other in a common light. When I worked in Greece, each season the entire town came together for a glendi (party) where excavators and locals ate, drank and danced together. In Egypt we went to colleagues’ houses and ate until we simply couldn’t eat any more. I now work in Iraq and there we hold an end-of-season feast with the local village where we all share in food and music. These gatherings help us to connect and stay connected. Similarly, gatherings of peoples in the past likely helped lead to the social organizations of cities and civilization as we know it. The University of Pennsylvania Museum of Archaeology and Anthropology (best known as the Penn Museum), where the author works—is one of the world’s best museums dedicated to anthropology and archaeology. 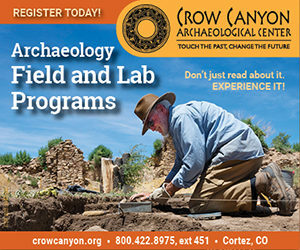 Readers can find out more about the Penn Museum by going to the website.